Going Bananas is a move in DK: King of Swing that is learned in Cranky's Lectures. This move can be activated by pressing the button when the player has twenty bananas. When activated, Donkey Kong becomes invincible, but only for a short amount of time. 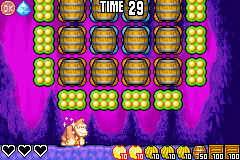 When in use, Going Bananas can help Donkey Kong break through multiple barrels at one time. It also makes Donkey Kong faster and quicker. This page was last edited on March 13, 2019, at 13:54.